The recommended absolute limit for recreational SCUBA divers is just 130 feet, and technical dives using Trimix bottom out at 330. Even then, you've got less than five minutes at depth before requiring monitored decompression to avoid getting the bends (the not-scary word for when nitrogen dissolves into your tissue under the massive pressure of the water column, is ejected into the bloodstream during ascent, and you die of a brain embolism). Interestingly though, once your body hits its nitrogen saturation limit, it doesn't matter if you stay down for an hour or a month; your decompression time effectively maxes out. This technique, known as saturation diving, is how recovery divers working on the K-141 Kursk were able to spend hours 300 feet below sea level (amidst 10 atmospheres of pressure) and how the crew in The Abyss were able to do their jobs. 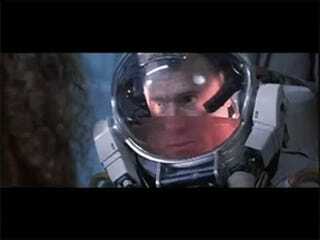 Perhaps the best-remembered scene from the 1989 Sci-Fi classic The Abyss is when Ed Harris' character has to don a liquid-filled diving suit in order to descend into the Mariana Trench. He and attempts to breathe what appears to be hot ham water in order to prevent the surrounding pressures from popping his lungs like bloody balloons. Turns out, this scene is closer to science fact than science fiction. The substance is a perfluorocarbon (PFC), a synthetic liquid fluorinated hydrocarbon—clear, odorless, chemically and biologically inert, with a low surface tension and high O2/CO2 carrying capacity. PFCs can hold as much as three times the oxygen and four times the carbon dioxide as human blood. They also act as very efficient heat exchanges. This makes PFCs ideal for use as a liquid ventilation (LV) medium for medical applications. Research into liquid ventilation (when you breathe an oxygen-rich liquid instead of air) and PFCs began in earnest immediately following the end of the first World War, when doctors studying treatment of poison gas inhalation began applying saline solutions to test subjects' (in this case, dogs) lungs. PFCs themselves were developed in the early 1940s as part of the Manhattan Project. They were dubbed "Joe’s stuff." However it wasn't until the 1960s that the field really took off. It was the height of the Cold War and the US military needed a way to increase the escape depth from the numerous submarines it had parked around the globe in the event of a catastrophic systems failure. In 1962, Dr. Johannes A. Kylstra and his team from Duke University showed that mice could be conditioned to breathe an oxygenated saline solution pressurized to 160 atmospheres (or 1 mile below sea level), although they just died a few minutes later from respiratory acidosis (carbon dioxide poisoning). The system was far from perfect, but illustrated that such a technique was indeed possible, albeit not yet plausible. Subsequent experiments performed by Leland C. Clark, Jr. and Frank Gollan showed that mice could breathe PFCs under normal atmospheric conditions, rats could remain submerged for up to 20 hours, and cats could last weeks. Their study also employed silicone oils as an alternative to PFCs but, as it turns out, silicone oil is really toxic to mammals (but only after returning to breathing normal air). PFCs are currently the only acceptable liquid ventilation medium we know of. In 1989, human trials began in Philadelphia. Several near-death infants suffering from severe respiratory distress were administered total liquid ventilation—completely filling the lungs with PFC fluid vs filling them to their functional residual capacity—and showed some remarkable physiological improvements, including lung compliance and gas exchange. And that might just be the trick. During normal development, the fetus' lungs are filled with amniotic fluid and, once they're born, a chemical known as surfactant helps prevent the lungs from collapsing. Premature babies, however, have not yet developed enough surfactant to prevent their lungs from folding in on themselves, so when they're suddenly exposed to a gas atmosphere they struggle just to breathe. The Philadelphia trials aimed to see if liquid ventilation could accurately recreate conditions within the womb, act as an artificial surfactant, and reduce the neo-natals' stress. While the efforts weren't enough to save lives, the lung performance improvements remained even after removing the ventilator, and proved that liquid ventilation was a potent therapy for premature babies. Despite its relative success during the Philadelphia trials, total liquid ventilation (TLV) remains very much an experimental procedure. In order to accurately and safely control the volumes of PFC flowing in and out of a patient's lungs, TLV systems require a membrane oxygenator, a heater, and an array of pumps to deliver the PFC—essentially, a dedicated liquid ventilator. Unfortunately, such a device has yet to make it past the prototype stage. Partial Liquid Ventilation (PLV), on the other hand, only fills up about 40 percent of the patient's lungs with PFC, with the remaining capacity filled by air from a conventional gas ventilator. This means that PLV can be used with existing FDA-approved equipment and can be used to treat acute lung injuries as well as preemies. The PFC helps dislodge debris from alveoli (say, from smoke inhalation), open clogged pathways, and transport oxygen deeper into the lungs while protecting them from collapse and minimizing secondary damage. But we still haven't overcome the issues that killed Kylstra's mice. The high viscosity of PFC prevents it from cycling through the lungs efficiently enough to exorcise CO2 and prevent respiratory acidosis. You'd have to cycle the fluid at a rate of 5 liters per minute to match a standard resting metabolism, 10 liters a minute for any sort of activity, and the human lungs simply aren't strong enough for such a task.